They can be broadly divided into two groups – patella instability and pain. This is where the patella dislocates or subluxes (partially dislocates). In everyone the pull of the quadriceps muscles tends to pull the patella laterally. In some patients this tendency is greater than others due to their own individual body shape and bony anatomy. These patients are pre-disposed to subluxation or dislocation and can dislocate their patella for the first time with less severe, and for some patients, even trivial trauma. Some patients without such a pre-disposition can sustain a more severe injury that causes the patella to dislocate. When a patella dislocates for the first time, it causes rupture or stretching of a ligament on the inside of the knee called the medial patello-femoral ligament (MPFL). This ligament normally is the primary restraint preventing lateral dislocation of the patella. After a dislocation this ligament remains stretched and no longer restrains the patella resulting in an increased risk of further dislocations/subluxations. The overall risk of having further episodes of patella instability is in the order of 50%, although the individual risk varies enormously depending on the pre-disposing factors present. 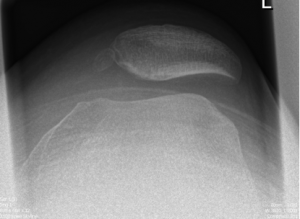 The diagnosis is often clear with a history of lateral dislocation of the patella followed by marked pain and swelling.On examination there is tenderness over the stretched MPFL. After the pain and swelling of the acute injury has settled abnormal lateral movement of the patella is often apparent and patients are often very apprehensive when the patella is moved laterally (patella apprehension). An MRI scan can occasionally be of use to confirm the diagnosis and to identify any other injuries in the acutely painful and swollen knee following a dislocation. Surgery is most commonly in the form of a medial patello-femoral ligament reconstruction but can also involve realignment of the patello-femoral joint with an osteotomy of tibial tuberosity to alter the angle of pull of the quadriceps tendon and sometimes more complex operations. In addition to the acute problems of dislocation, the tendency of the patella to be pulled laterally can lead to increased pressure on the lateral aspect of the patello-femoral joint, leading to pain, muscle weakness and the development of tight tissues on the lateral aspect of the knee lateral retinaculum. Patella tendonitis (jumper’s knee). This is a degenerative process affecting the patella tendon that typically occurs where the patella tendon attaches to the patella. Most patello-femoral problems are diagnosed clinically on the basis of the history of symptoms and the findings on examination. Fortunately, most patients with anterior knee pain from whatever cause benefit from physiotherapy that is tailored to their precise problem. Surgery can be indicated for patients who do not respond sufficiently to physiotherapy and they can often benefit from arthroscopic intervention. For patients with a tight lateral retinaculum, arthroscopic lateral release, where the tight tissues are divided to reduce pressure on the patella, can be of great benefit. Patients who develop severe arthritis affecting the patello-femoral compartment of the knee only might eventually require a patello-femoral joint replacement.